Practicing with punches to get more than just a corner punch or even learning how to make a corner with a straight border punch is very interesting. Really makes the most out of your tools. It's Christmas time again this week and even found 3 other challenges this would fit into. I think I've even made it before the deadlines. It's amazing when you get behind how difficult it is to get back on track. The snowflake charm and the silver dots are my metal. I have to tell you I'm really loving this pad of Christmas paper from My Mind's Eye so you'll probably get tired of seeing it before Christmas is over. Supplies: White Card Blank 5" X 6 1/2" Halcraft, Papers: My Mind's Eye-Christmas Holiday Glitter Book, Best Occasions textured card stock, Stamps: Inkadinkado-98412 Christmas Tag Wishes, Ink: Ranger Archival Ink-Cobalt, Martha Stewart-Snow Flurry punch, Stampin Up-1 1/4" circle punch, Making Memories-epoxy eyelet charms, Craf-T Products-Luster Rub-Ons, Michael Richards-metal dots, pop dots. Wow another stunner and I agree with you those papers a fabby. Perfect borders and fabulous metal charm. Thank you for joining us at Bah! Humbug! 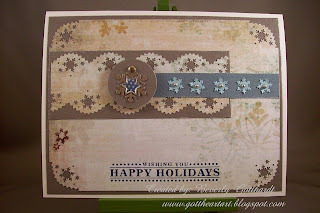 Beautiful borders and super papers combine to make another lovely card. Thank you for joining in at Bah! Humbug! this week. oh so gorgeous colour scheme on this Barb. It's a beauty.